Having successfully completed my postgraduate degree in Architecture at The University of Nottingham, I decided to take on an adventure and join Lungfish Architects. Being the newbie was daunting at first but soon changed. The Lungfish team is full of likeminded, young professionals with a keen interest in good quality design that caters for the end user; a great team to work with. My joining the team coincided with the company’s quarterly team away day last month, which was timely! The culture at Lungfish is one that recognises the value in regularly taking its team out of the intense studio environment to encourage creativity and return refreshed and full of new ideas. The whole team headed down to the capital for a two day visit to the London Design Festival 2017 – a celebration of the broad scope of local and international design. On the evening we arrived, we spent time walking around Design Junction (Kings Cross) – an exhibition focusing on cutting-edge interior design including the very best in furniture, lighting and product design. Forming a distinctive entrance through the central fountain space of Granary Square was a Turkish ceramics collaboration, a striking and fully immersive ceramic installation. 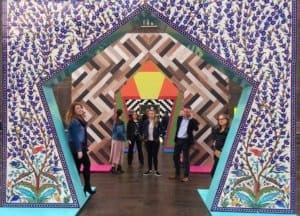 ‘Gateways’ had been formed from a series of tiled gates that invite you to walk towards and into the newly refurbished UAL Campus for Central Saint Martins. Immediately the look and feel of this building stood out to us over the ornate lighting features sat within it. Designed to bridge an old 19th century Grade II listed granary with its accompanying transit sheds, the architecture has created a building with a modern, clean lined internal street which provides a large, social space full of natural light. This was a great insight for our into how a contemporary architectural intervention has worked well within an existing building and what can be achieved with a larger budget. 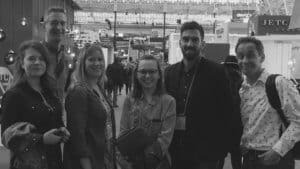 The next morning we met for breakfast and then split into two teams to visit different exhibitions across London, with the objective of creating presentations on the fly via tablets and then reconvening at the end of the day to discuss them. 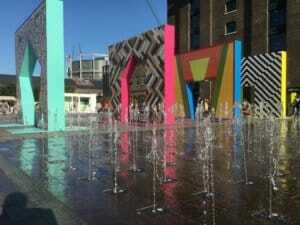 Team WKD visited London Design Fair, Boxpark and the V&A. I was part of Team Lycraah (coined from the first letter of everyone’s name) and we visited 100% design. After discussing our approach, we decided to spend our day looking through Instagram eyes with the aim of taking the most ‘Instagramable’ picture. 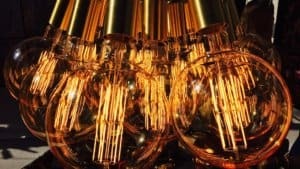 The exhibition consisted of lots of lighting features, materials and stylised products. All these elements presented themselves as dynamic, distinctive and playful features that could be used within high-end interiors. We were enthused by the concentration of creativity within a single environment. Having focussed our thoughts on these products through a camera lens, it was interesting to walk around London with a refreshed outlook, mindful of how materials, colours, form and light are used within the architecture all about us. We reminded ourselves that we must take time to appreciate the architecture around us and pause for a moment to review and discuss the merits of material use and form. 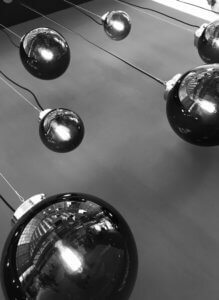 Light fittings make wonderful photos!